In the unlikely event of a volcanic supereruption at Yellowstone National Park, the northern Rocky Mountains would be blanketed in meters of ash, and millimeters would be deposited as far away as New York City, Los Angeles and Miami, according to a new study. An improved computer model developed by the study’s authors finds that the hypothetical, large eruption would create a distinctive kind of ash cloud known as an umbrella, which expands evenly in all directions, sending ash across North America. A supereruption is the largest class of volcanic eruption, during which more than 1,000 cubic kilometers (240 cubic miles) of material is ejected. If such a supereruption were to occur, which is extremely unlikely, it could shut down electronic communications and air travel throughout the continent, and alter the climate, the study notes. A giant underground reservoir of hot and partly molten rock feeds the volcano at Yellowstone National Park. It has produced three huge eruptions about 2.1 million, 1.3 million and 640,000 years ago. Geological activity at Yellowstone shows no signs that volcanic eruptions, large or small, will occur in the near future. The most recent volcanic activity at Yellowstone—a relatively non-explosive lava flow at the Pitchstone Plateau in the southern section of the park—occurred 70,000 years ago. Researchers at the U.S. Geological Survey used a hypothetical Yellowstone supereruption as a case study to run their new model that calculates ash distribution for eruptions of all sizes. The model, Ash3D, incorporates data on historical wind patterns to calculate the thickness of ash fall for a supereruption like the one that occurred at Yellowstone 640,000 years ago. The new study provides the first quantitative estimates of the thickness and distribution of ash in cities around the U.S. if the Yellowstone volcanic system were to experience this type of huge, yet unlikely, eruption. Cities close to the modeled Yellowstone supereruption could be covered by more than a meter (a few feet) of ash. There would be centimeters (a few inches) of ash in the Midwest, while cities on both coasts would see millimeters (a fraction of an inch) of accumulation, according to the new study that was published online today in Geochemistry, Geophysics, Geosystems, a journal of the American Geophysical Union. The model results help scientists understand the extremely widespread distribution of ash deposits from previous large eruptions at Yellowstone. Other USGS scientists are using the Ash3D model to forecast possible ash hazards at currently restless volcanoes in Alaska. 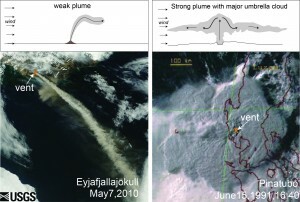 Unlike smaller eruptions, whose ash deposition looks roughly like a fan when viewed from above, the spreading umbrella cloud from a supereruption deposits ash in a pattern more like a bull’s eye – heavy in the center and diminishing in all directions – and is less affected by prevailing winds, according to the new model. “In essence, the eruption makes its own winds that can overcome the prevailing westerlies, which normally dominate weather patterns in the United States,” said Larry Mastin, a geologist at the USGS Cascades Volcano Observatory in Vancouver, Washington, and the lead author of the new paper. Westerly winds blow from the west. “This helps explain the distribution from large Yellowstone eruptions of the past, where considerable amounts of ash reached the west coast,” he added. The three large past eruptions at Yellowstone sent ash over many tens of thousands of square kilometers (thousands of square miles). Ash deposits from these eruptions have been found throughout the central and western United States and Canada. Erosion has made it difficult for scientists to accurately estimate ash distribution from these deposits. Previous computer models also lacked the ability to accurately determine how the ash would be transported. Using their new model, the study’s authors found that during very large volcanic eruptions, the expansion rate of the ash cloud’s leading edge can exceed the average ambient wind speed for hours or days depending on the length of the eruption. This outward expansion is capable of driving ash more than 1,500 kilometers (932 miles) upwind – westward — and crosswind – north to south — producing a bull’s eye-like pattern centered on the eruption site. 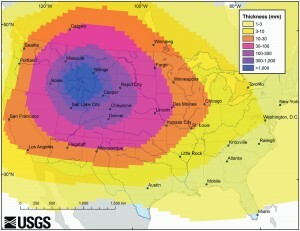 In the simulated modern-day eruption scenario, cities within 500 kilometers (311 miles) of Yellowstone like Billings, Montana, and Casper, Wyoming, would be covered by centimeters (inches) to more than a meter (more than three feet) of ash. Upper Midwestern cities, like Minneapolis, Minnesota, and Des Moines, Iowa, would receive centimeters (inches), and those on the East and Gulf coasts, like New York and Washington, D.C. would receive millimeters or less (fractions of an inch). California cities would receive millimeters to centimeters (less than an inch to less than two inches) of ash while Pacific Northwest cities like Portland, Oregon, and Seattle, Washington, would receive up to a few centimeters (more than an inch). Even small accumulations only millimeters or centimeters (less than an inch to an inch) thick could cause major effects around the country, including reduced traction on roads, shorted-out electrical transformers and respiratory problems, according to previous research cited in the new study. Prior research has also found that multiple inches of ash can damage buildings, block sewer and water lines, and disrupt livestock and crop production, the study notes. The study also found that other eruptions – powerful but much smaller than a Yellowstone supereruption — might also generate an umbrella cloud. “These model developments have greatly enhanced our ability to anticipate possible effects from both large and small eruptions, wherever they occur,” said Jacob Lowenstern, USGS Scientist-in-Charge of the Yellowstone Volcano Observatory in Menlo Park, California, and a co-author on the new paper. Yellow stone seem to be warming up there have been a lot of earthquake in California for this year especially this month. And when we see animals running from the yellow stone area is not a good sign because we know that when you see animals running we know something bad is on it way this could mean that the big one is on it way (earthquake) with now we have report of the road melting we should take head and the government preparing for the worse behind our back . that is a strong case to prepare because the truth is that the government cannot help every one and they will help it self first before it you. 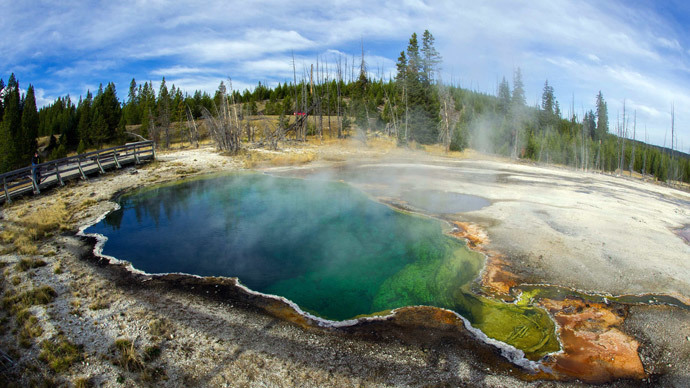 How do we know what’s beneath Yellowstone, and how can we image the shallow magma? 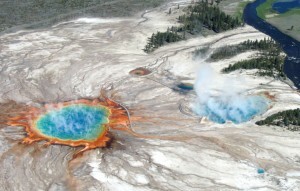 Seismologists at the University of Utah (a YVO member agency) and the Swiss Federal Institute of Technology undertook a study to image the Yellowstone magma reservoir through a technique called seismic tomography. Using improved methods and data from thousands of earthquakes; they discovered that the magma reservoir is much larger than inferred in previous studies. The results from this new approach are published in the Journal Geophysical Research Letters. Yellowstone subsurface cross-section, schematic drawing oriented SW-NE, depicting rise of magma from beneath the mantle and the heating and movement of mantle and crustal material. Click to enlarge.To create an “image” of themagma storage region (reservoir), the research team used data from the Yellowstone Seismic Network from 1984-2011 including 4,520earthquakes and a total of 48,622 individual travel time measurements. They then mapped how fast the P-waves (the fastest type of earthquakewave) moved through different parts of the subsurface beneath Yellowstone. The resulting model reveals a very large region where P-waves move more slowly, interpreted to be due to the presence of warm, partially melted rock; that is the crustal magma storage region that has fueled Yellowstone’s past volcanic activity. The inferred magma body is 90 km long, extends from 5 km to 17 km depth, and is 2.5 times larger than imaged in a previous study. Analysis of the data reveals that the magma reservoir contains between about 5 and 15% molten rock (melt) that occupies pore spaces between solid (crystalline) material. Magma typically does not erupt unless it has greater than 50% melt. Importantly, the low-velocity body extends about 15 km NE of the caldera at depths shallower than 5 km. This shallow region to the northeast could contain some partial melt but is most likely due to the presence of hot water, other fluids, and gasses coming off of the main body of the magma reservoir. This region correlates with a concentrated area of low-density rocks (with a large negative “Bouguer” gravity anomaly) as measured by gravimeters, instruments that measure the local gravity field. This northeasterly progression of the magma system is consistent with the southwestern movement of the North American Plate at ~2.35 cm/yr over a stationary plume of hotter mantle material (the Yellowstone hot spot) that is located beneath about 60-90km. The increase in the inferred size of the magma reservoir is due in part to the greater extent of coverage by the Yellowstone Seismic Network, especially in the northeast part of the park. Six new seismographs were added over the last decade to better image the northeast part of the park and explore the region with the large negative gravity anomaly. This research and resulting updated seismic image provides important constraints on the dynamics of the Yellowstone magma system and its potential for future volcanic eruptions and earthquakes. The larger imaged size of the magma reservoir better matches the geologic record of Late Quaternary volcanic eruptions and lava flows but, importantly, does not increase the volcanic hazard in the Yellowstone region. The ever-changing thermal geology of Yellowstone National Park has created a hot spot that melted an asphalt road and closed access to popular geysers and other attractions at the height of tourist season, officials said Thursday. “It basically turned the asphalt into soup. It turned the gravel road into oatmeal,” Yellowstone spokesman Dan Hottle said. The affected roadway offers access to the Great Fountain Geyser, White Dome Geyser, and Firehole Lake. While thermal activity under the park often gives way to temperature fluctuations that can soften asphalt throughout Yellowstone, Hottle said the latest wave seems worse than usual. Maintenance workers now must lift the melted asphalt from the roadway, then apply sand and lime to soak up any remains, according to Hottle. The spokesman said he hopes the road will be reopened by next week, adding that he does not believe the activity will significantly curb visits to the park. Yellowstone’s supervolcano last erupted about 640,000 years ago, according to US Geological Survey records. Last December, geologists reported that the magma reservoir under the supervolcano is two-and-a-half times larger than previous estimates. The supervolcano has the potential to spew more than 240 cubic miles (1,000 cubic kilometers) of magma across Montana, Idaho, and Wyoming. “We believe it will erupt again someday, but we have no idea when,” Farrell told National Geographic. In March, a viral video of bison stampeding through the park gave rise to rumors of an imminent eruption. In early April, scientists and park officials debunked the fears, saying the bison run was a natural migratory occurrence, not a sign of impending volcanic activity. That very same week, a 4.8 magnitude earthquake shook the northwest section of the park, marking the largest seismic activity at Yellowstone since 1980. The earthquake occurred near “an area or ground uplift tied to the upward movement of molten rock in the super-volcano, whose mouth, or caldera, is 50 miles long and 30 miles wide,” Reuters reported at the time. The uplift does not make volcanic activity more likely, though, according to Peter Cervelli, associate director for science and technology at the US Geological Survey’s Volcano Science Center in California. “The chance of that happening in our lifetimes is exceedingly insignificant,” he said. Contracts worth hundreds of billions of dollars presented to at least 4 countries will run from 2014-2024, a 10-year span in which the Yellowstone supervolcano is expected to erupt, devastating a large portion of the U.S.
(INTELLIHUB) — According to a recent report, the African National Congress (ANC) recently turned down a $10B a year disaster management plan offered by the United States to house American citizens who may become displaced in the event that the Yellowstone supervolcano erupts. The U.S. plan for relocation was formulated after a recent scientific analysis of the park revealed that Yellowstone’s supervolcano has the potential to violently erupt within the next 10-years as noted by others including the famous astrophysicist Michio Kaku. It may take up to ten years for printing in the magma chamber of the super volcano to build. According to Dr. Jean-Philippe Perrillat of the National Centre for Scientific Research in Grenoble, France, “it is the difference in density between the molten magma in the caldera and the surrounding rock big enough for the magma from the chamber to the surface to increase “. According to the report, “Brazil, Argentina and Australia” jumped on the bandwagon, accepting the request from Washington. Shockingly, this all comes at a time when wild animals have been reported to be fleeing the park from seismic vibrations. It has also been reported that earthquake swarms in the area have become more rampant. Recent reports suggest that ancient Helium4 gas has breached the surface layers of Yellowstone’s crust,escaping into the atmosphere. Now couple that with the recent and abrupt ground level rise in the park–and we may be looking at a spell for disaster. I don’t know about you but to me the thought of living in that region is horrifying, but what do I know, I live right near a massive volcano myself in Hawaii. Later in the newscast the popular physicist points out how a 1000-mile ring of the U.S. would likely be destroyed if the supervolcano actually went. And as scary as that seems to some, we are actually quite overdue for the big one. In fact, the last Yellowstone eruption was thought to have happened around 630,000-years ago, meaning we are 30,000-years overdue for a total explosion.